See the most beautiful attractions of Zhangjiajie, featuring pristine natural scenery of grotesque peaks, clear water, and dense forests. Grasp the chance to visit the world&apos;s longest and highest glass-bottomed bridge- the Grand Canyon Glass Bridge. We will help you make the best use of your time and energy to see the essence of this World Heritage Site, and see in person why it inspired Avatar&apos;s Hallelujah Mountain. 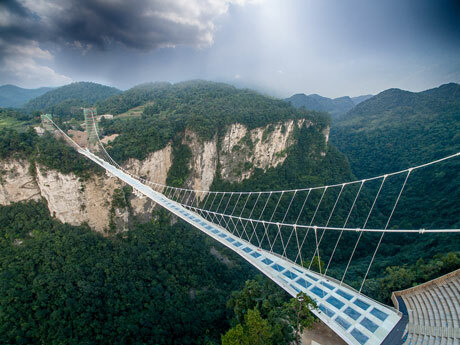 Visit the world-record-holding Zhangjiajie Grand Canyon Glass Bridge! Most flights land in Zhangjiajie in the evening. Upon arrival your local tour guide will meet you at the arrival hall of the airport with a name plate. If you arrive by train, your local tour guide will meet you with a name plate at the exit of the train station. After meeting your tour guide, he/she will take you by private van and driver to your hotel. Have a good rest and be ready for the next day&apos;s adventure! To avoid waiting in long queues, our tour guide will suggest the best time to start the day, and might suggest you get up early or alter your attraction schedule. Please kindly understand and cooperate. 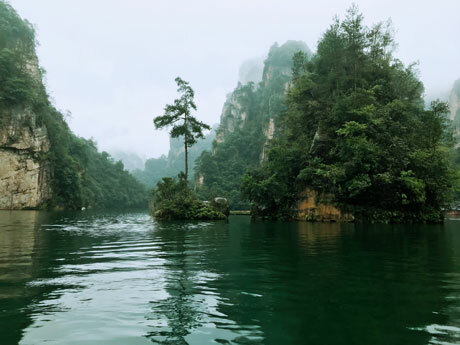 Your private guide and driver will pick you up at your hotel and take you to Wulingyuan Scenic Area, where Zhangjiajie National Forest Park is located, to visit its two most classic and popular attractions. 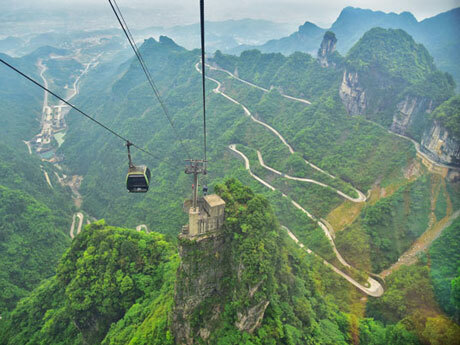 Take a cable car up to Tianzi Mountain, and you will see large areas of grotesque peaks thrusting up. Walking along the steps spectacular views unfold in front of you from different angles. Lunch in the moutain area is simple and in Chinese-style arranged at a local restaurant. There is a McDonald&apos;s near Tianzi mountain, if you prefer western style we can have lunch there, for a good rest indoors with air-conditioning. In the afternoon, ride a public shuttle bus to Yuanjiajie Scenic Area, whose mountains are said to be the inspiration for Avatar&apos;s Hallelujah Mountain. This area is the most visited area due to its fame. It takes about 1 hour to walk the tourist trails, before you take the shuttle bus for the cable car down the mountain. There is another option for getting down the mountain - Bailong Elevator. This glass elevator was built on the side of a cliff, and it claims to be the world&apos;s highest of its kind. It takes only 2 minutes, but at peak times you might need to queue one or two hours to take it. If you are interested in taking the elevator, tell your guide in advance, so that he/she can arrange beforehand to avoid the long queues. Retire to a hotel near Zhangjiajie National Forest Park, to save time on transportation and avoid morning crowds on day 3. Evening free time recommendation: The Xibu Ancient Streets are a Tujia minority culture and tourist area. They contain a local snack street, a folk culture souvenir street, and a bar street. 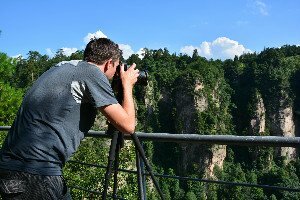 About 2 km from the hotels area of Zhangjiajie National Forest Park, it is a convenient place to explore in your evening free time. Besides, street barbecues are very popular in Zhangjiajie. Try sitting down and enjoying the barbecue and local beer like a local! Breakfasts offered at the hotels are usually Chinese-style, with not much choices. If you prefer, your guide can pack you some bread, instant coffee, and fruit for an alternative breakfast. 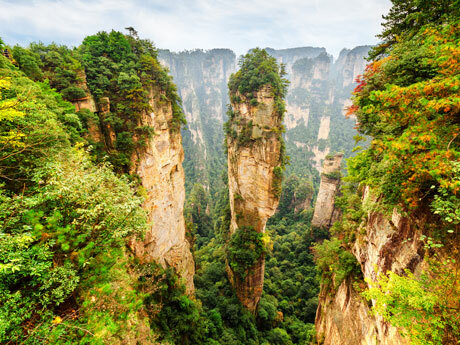 Zhangjiajie Grand Canyon is a recently developed natural wonderland. It incorporates mountains, streams, caves, cliffs and forest. The world&apos;s longest & highest glass-bottomed bridge is located in this area. Walking along this glass bridge 300 meters above ground-level will be one of the coolest experiences of your tour! If you prefer not to walk on the bridge, we&apos;ll take another route to visit the area. Then drive to Baofeng Lake that is in a basin in the middle of this mountainous area. You need to walk about 20 minutes to reach the lake; then you&apos;ll enjoy a 30-minute ride in a wooden boat. It is a leisurely experience as you cruise on the clear water, view hills of various shapes, and enjoy the entertainment of local minority people singing their traditional songs. The world&apos;s longest and highest glass-bottomed bridge, Zhangjiajie Grand Canyon Glass Bridge, started trial operation on Aug. 20th, 2016. During the trial operation, entrance tickets can only be obtained by reservation, and travel agencies have first priority for ticket purchase. Tickets are limited to 8,000 per day. Book with us as soon as possible and seize the opportunity! 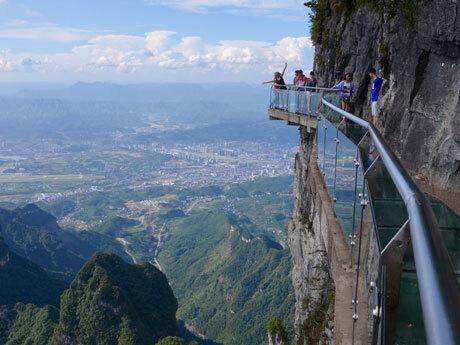 Your heart will beat fast at Tianmen Mountain on the world&apos;s longest cable car, the suspended glass walkway almost a mile (1,430 meters) above the ground, and the &apos;99 Bends&apos; mountain road. Tianmen Mountain is regarded as the &apos;soul&apos; of Zhangjiajie, its highest mountain. The views include graceful ancient trees, karst hillocks and long roads that are carved from the sides of the cliff. The cable car takes 30 minutes from the city center to the mountain top and is the longest cable in the world. Tianmen Cave (literally &apos;Heaven&apos;s Gate Hole&apos;) is a 30-meter-high hole formed naturally in the mountain like a doorway, well-known for being glided through by a world-class stuntman in a wing suit. To reach the hole, you can climb for about half an hour up the &apos;Stairway to Heaven&apos;. After the trip we will send you to the airport and wave goodbye. Tianmen Mountain is adjacent to Zhangjiajie city, so we put it in the last day of the tour, when its convenience for the airport / train station is most useful. Weekend Travel Idea for EXPATS, business people, etc. Friday night: Most flights land in Zhangjiajie in the evening, so you can take an evening flight after work. Cities with direct evening flights to Zhangjiajie: Beijing, Shanghai, Guangzhou, Shenzhen, Guilin, and Kunming. 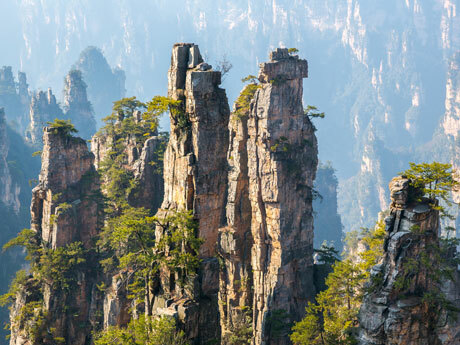 Saturday: See the highlights of Zhangjiajie: Yuanjiajie and Tianzi Mountain. Your personal tour guide will accompany you throughout the tour, providing guiding service and local knowledge. He/she is ready and willing to help you solve problems while on the tour. Star-rated hotels in Zhangjiajie might not be up to the standard of those in big cities like Beijing and Shanghai. Most hotels in Zhangjiajie opened over 10 years ago and have not undergone renovation, so the facilities might not be very new. For example, 4-star hotels in Zhangjiajie might only compare to economy standard hotels in cities like Shanghai. The hotels we use in the tour are carefully selected based on criteria like hotel environment, location, service, and previous customer feedback. Breakfast at a 4-star hotel at Zhangjiajie is very basic, and 5-star hotels breakfast is usually Chinese style mixed with some western choices. We suggest you bring your own toiletries and towel, and if you meet any problems in your hotel, our tour guide will help you arrange with the hotel to make your stay as comfortable as possible. If you have other hotel choices or wish to book hotels by yourself, feel free to tell us your idea. Restaurant and cuisine choices are very limited in the national park. We will find the best available, but it is also suggested that you bring some snacks. Local villagers sell water and food like fruits and corn on the mountains, which are good to try while you climb the steps. As for dinners (not included in the tour), you will have better and more choices while you are down the mountain. Feel free to ask your tour guide for recommendation of restaurants and dishes to try. There are no vegetarian restaurants available in Zhangjiajie. For vegetarian travelers, please tell us your meal requirements in advance, so that we can make relevant arrangement for you. It is foggy/rainy for over 200 days per year in Zhangjiajie, but the mists make Zhangjiajie mysterious. It might rain or be foggy (obscuring some of the view), but even then the scenery is beautiful. A pair of comfortable walking shoes with good grip is a must. Clothing: In summer, bring mosquito repellant, sunglasses, sun block and hat. Prepare an extra light coat for the cool early mornings and evenings. Bring warm clothes for winter, but you will get warmer climbing the mountains, so layers are recommended for flexibility.